If you’re serious about combat sports then you’ll almost certainly want to have at least one punchbag in your house, you may even want to have two so you can alternate your training between a heavy bag and a speed bag. Even if you’re not specifically into combat sports, training with either a heavy bag or a speed bag is great cardio and also works out your muscles and if you want it to be your regular workout then having your own punch bag or bags will usually work out much more cost effective than going to a gym. Another plus about punching bags is that they are actually quite compact as compared to other forms of home gym equipment. This can make them a great choice for small-space fitness. There is, however, the practical challenge of finding an appropriate place to put them. The obvious choice may seem to be to hang them from the wall or ceiling, but, leaving aside the fact that landlords are unlikely to allow this, in some buildings, particularly, very old or very modern ones, the weight could prove to be something of an issue. There are basically two solutions to this problem. 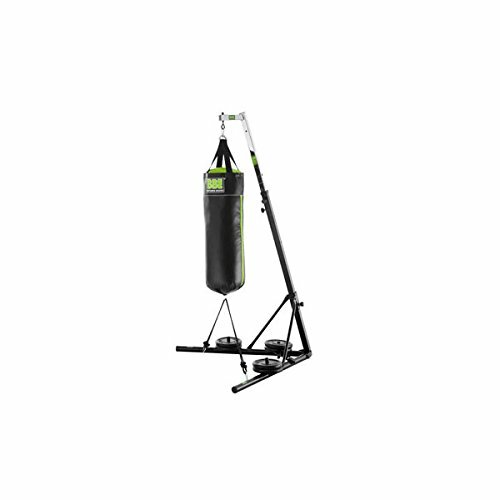 One is to use a free-standing punch bag, basically a punch bag which comes with its own stand. The other is to buy a punch bag stand which you can use with the bag or bags of your choice. Before choosing a heavy-duty punch-bag stand, it’s important to check exactly how much space you have available for it. Remember that even though a heavy-duty punch-bag stand may well fold up for easy transport, for practical purposes, you probably want to avoid the faff of setting it up and taking it down every time you use it, even if you’re “just” using a speed bag and especially if you’re using a heavy bag. Realistically, even the best punch-bag stand in the world is going to be a pointless purchase if it just sits in storage unused. Next, think about the purpose for which you intend to use your heavy-duty punch-bag stand. Some may be designed for specific drills (e.g. stands intended for kicking will have the widest legs), whereas others will have been designed to offer more flexibility in use. It’s also recommended to check the weight limit for the stand. If you’re buying a heavy-duty punch-bag stand from a reputable brand, such as the ones we list below, then you should be on safe ground with this, but it never hurts to double check. Similar comments apply to the construction quality. It can actually be sensible to choose a lighter-weight boxing-bag stand and use weights to keep it in place, but you still want (and need) the frame to be decently robust. We were very surprised how few boxing-bag stands there were in general so our original “long-list” was actually already quite a short-list, but even so, we whittled it down even further until it only contained the very best punch-bag stands we’d be happy to use ourselves and recommend to others. Our selection criteria included the overall design, construction quality and weight support, ease of assembly, robustness and general value for money. Here, then, is our pick of the best boxing-bag stands available on the UK market. We’ll say up front that there are a couple of potential downsides to the BBE punch-bag stand. First of all, taller people (people over about 5’8”) are probably going to find it a bit challenging to use for punches, although kicks should be just fine. Secondly, this stand only holds one bag at a time, whereas other stands can hold both a heavy bag and a speed bag. Not exactly a flaw, but a point worth noting, is that if you’re a heavy hitter, you’re probably going to want (if not need) to use more than the 60Kg of weight which is recommended to keep this boxing-bag stand in place. All that said, this is a nice, “no-frills-but-solid” boxing-bag stand, which gets the job done at an affordable price and without any fuss. 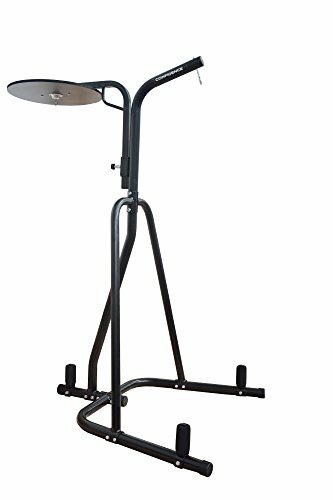 This boxing-bag stand is designed to hold both a heavy bag and a speed bag and while it’s more than up to handling the weight, the quality of the speed-back swivel does leave a lot to be desired, however, this should be an easy and affordable switch-out. The only real downside to this boxing-bag stand is that the tools provided for its assembly are not of the same sort of quality as the boxing-bag stand itself. Using them can therefore be something of a chore, but if you can buy or borrow a decent screwdriver and spanner and/or socket set, you’ll make your life much easier and if you can enlist the help of a friend as well then assembly should be plain sailing. Once you have this punch-bag stand set up, you’ll find it’s a reliable performer which really can give extensive service over a long period, regardless of how much you pound it. 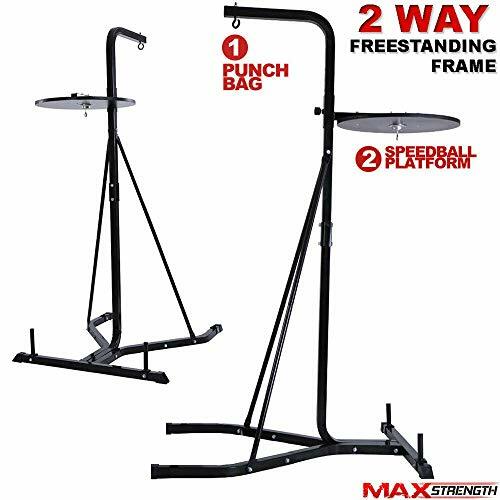 Even though it’s priced very affordably, the Max Strength boxing-bag stand is as robust as its name suggests and will let you pound away at your heavy bag without compromising the frame, which is both strong and very easy to set up. Obviously, you’ll need to add a decent amount of weight to keep this boxing-bag stand in one place, especially if you’re a heavy hitter, but that’s true of any boxing-bag stand. The height of the speedball platform is adjustable and the swivel is perfectly decent (and has a locking mechanism). In short, this is one very decent boxing-bag stand for one very decent price. Note: Punch bag and Speed ball are not included with this stand. The Xn8 boxing-bag stand supports not only a heavy bag (of between 60cm and 150cm) and a speed bagl (of between 20cm and 40cm), but also a double-end bag. According to the manufacturer, all three bags can be used simultaneously (up to the maximum weight). We assume this means that they can all be hung on the frame at the same time as we really can’t see how three people would manage to work out together without getting in each other’s way. Taller users should note that as this frame arrives, the speed ball is positioned about 180cm (6ft) off the ground, however there is nothing to stop you drilling extra holes in the frame or you might choose to take off the platform completely and mount your (light) speed bag onto a wall while keeping your punch-bag stand for your heavy bag. This boxing-bag stand has a very robust frame which is easy to assemble. As usual, you’ll need to add weights, especially if you’re a heavy hitter, but that’s par for the course with boxing-bag stands. Although the BBE punching-bag stand is described as being “unisex”, we’d say it was more likely to be the best punch-bag stand for women and children, i.e. people who are likely to be on the shorter side, especially if they were beginners and only wanted to use one bag. The Confidence and Max Strength punching-bag stands are both solid punching-bag stands and either one of them could be the best punch-bag stand for you if you just want a punch-bag stand to do a decent job for a decent price and don’t need (or want) anything more than a standard heavy bag and speed bag. 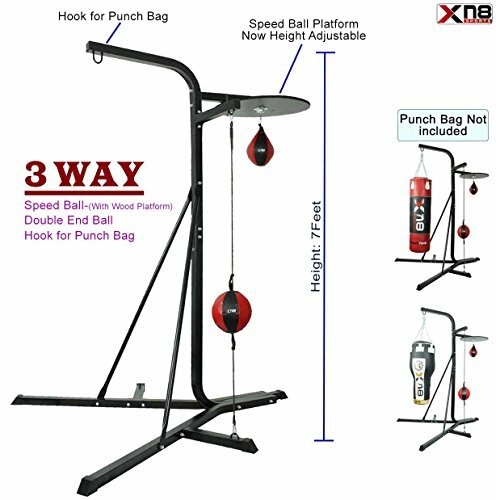 From an objective perspective, the Xn8 Sports punching-bag stand is arguably the best punch-bag stand because it has the most options and as such would probably be the best punch-bag stand for anyone who would value its flexibility.